The heads of the Pikuach Nefesh rabbinical organization, which represents 350 rabbis in Israel, sent President Shimon Peres a letter on Wednesday in which they condemned his remarks that the Jewish settlement enterprise in Judea and Samaria (Yehuda and Shomron) threatens Israel’s Jewish majority. In their letter, the rabbis asked Peres, “Is the disaster you caused Israel with the miserable Oslo Accords not enough that you continue to make dangerous statements and declare in advance, even without negotiations, that you want to get rid of parts of the Land of Israel? “You should have long ago bowed your head and asked for forgiveness from the thousands of victims of the ‘peace’ processes, from all the residents of the South, the communities in Judea and Samaria and around Jerusalem, for the murders of thousands of Jews following the agreements you led, and following the withdrawal from Gaza that you pushed for and initiated, causing hundreds of thousands of Jews to live daily in constant fear,” the rabbis wrote. The rabbis further noted that the danger to Israel is not in the demographic statistics and records “but rather from giving of land to Israel's enemies, and bringing them closer to the borders of the Jewish settlements – something you did with your own hands. “Only a determined and proud Jewish rule, which encourages Jewish birthrate and firmly maintains our borders while strengthening attachment to Jewish settlement throughout the Holy Land, will strengthen the safety and security of Israel in its land and bring real peace,” they concluded. 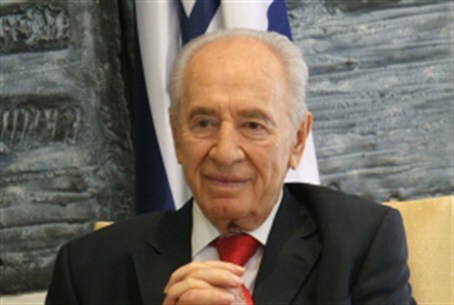 In Israel, the role of President is a purely ceremonial one and not a political one, but Peres has been Israel’s most political president to date, and has been accused of seeing himself as a de-facto foreign minister once again, as he was during the late Yitzchak Rabin's term of office when he engineered the disastrous Oslo Accords. Peres has reportedly met in secret with Palestinian Authority Chairman Mahmoud Abbas in the hopes of advancing his personal agenda of restarting peace negotiations. “This is a controversial statement from the ‘new Middle East’ school of thought, and it is harmful first and foremost to the institution of the presidency, which is dedicated to preserving national unity,” added Ariel.